We may be petite girls who love this extreme sport, but that doesn’t mean we should be underestimated! Though we are small, we are also strong and capable of great success in our sport! I love this line from a Midsummer Night’s Dream “And though she be but little, she is fierce.” Shakespeare knew what he was talking about! Okay sure, that not’s exactly what he meant when Helena said that about Hermia, but let’s just pretend! Comparing sizes – It’s never a good idea to compare yourself to others, and in kitesurfing it is no different! It can be difficult not to compare yourself to the other kitesurfers out there – in and out of the water, online or in real life. But it is important to stay true to yourself and realise that everyone is different. You may sometimes struggle learning certain tricks or getting out in certain conditions, when others find it easy. And you may sometimes find yourself comparing your session with others and realising you had completely different experiences. Don’t feel left out because like I said, everyone is different! Kite size – I can’t tell you how many times I’ve been teased about riding my tiny 5m kite while everyone else is on 10m kites! And then sometimes in really strong wind, I have been on the same size kite as men twice my size! In general, the smaller you are, the smaller your kite will be. Smaller kites are used in strong wind and bigger kites are used in light wind. My best advice would be to test out different sized kites in different wind speeds and see what works best for you. And again, don’t compare yourself to others! Do what works for you. There are so many different factors that come into play when it comes to choosing a kite size. 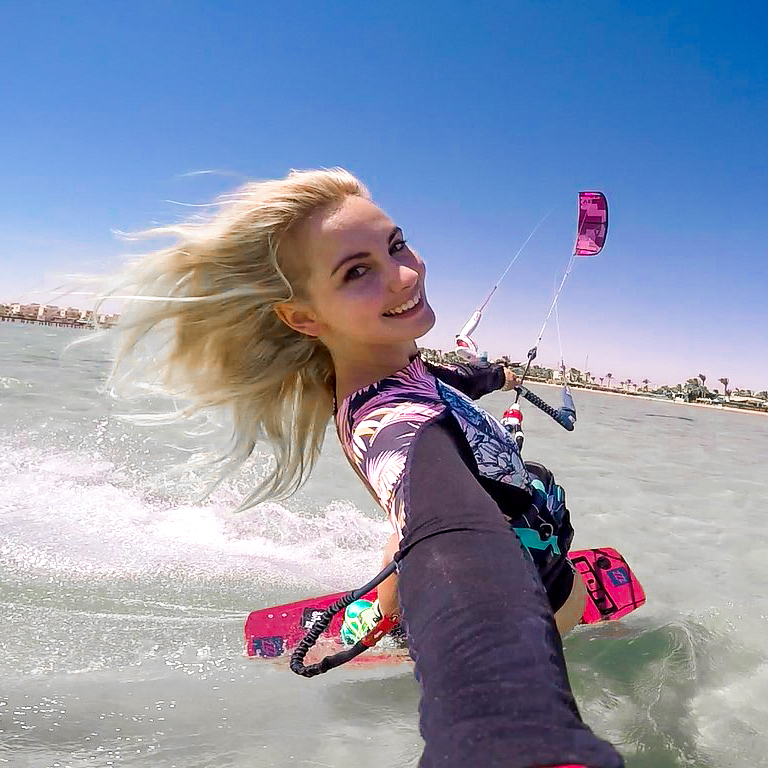 You could be on a completely different sized kite to another girl who looks like she is the same size as you, and you can both be having a great time! Remember that things like muscle mass, strength and skill level all come into play. Different types of kites also react differently and some riders like more power and speed than others. Wetsuit size – Over the years I’ve tried almost all the different wetsuits brands and I am happy to have settled on ION at the moment. They have an XXS option which is amazing! They also have a very large variety of female wetsuits in all different styles – long or short arms and legs – whatever you like! And also in a range of different colours – from the regular black to more bright colours, all with beautiful designs. For my full wetsuit I use an XS and for my short wetsuits I use XXS. Both sizes fit me perfectly, but I like my short wetsuits to be extra tight, just to keep everything in place ha ha! With some other wetsuit brands I’ve found that the arms and legs can sometimes be too long but the latest ION collection seems to have gotten the proportions perfect. Did you know that when I first started kitesurfing we couldn’t afford a new wetsuit so I had to use a second hand men’s wetsuit that was way too big for me! I used to wear a rash vest over my wetsuit to try and hide the folds of the baggy fabric underneath. We all have to start somewhere and we all learn valuable lessons along the way. One thing I’ve learnt is that a good fitting wetsuit is CRUCIAL to the enjoyment (and warmth) of your session! Harness size – This is something I’ve really struggled with, my harness size! There is nothing worse than trying to kite with a harness that is too big for you, especially if it is a waist harness that keeps riding up! If you’re a petite rider, make sure you get a harness that fits snug enough. Make sure that when you fasten your harness tightly, it is still able to be fastened even tighter – just in case it loosens a bit while you are riding, or for when you ride without a wetsuit and need it a little tighter. And when it comes to a waist or seat harness, it is all up to personal preference and what style of riding you intend on doing. If you want to push your freestyle or waveriding, consider using a waist harness. But if you just want to cruise and take it easy, a seat harness may be more comfortable for you. Some riders with back problems also prefer a seat harness or a waist harness with memory foam lining the back. I used a seat harness as a beginner and then moved onto a waist harness as soon as I got confident riding upwind. I use an XXS waist harness from ION. Bar size – I like my bar to be as little as possible! But not everyone likes a short bar, so it is all up to what you prefer or what you are used to. I am usually riding tiny kites in strong wind, so a short bar with 22m lines works perfectly for me. The short bar makes the kite a little slower and 22m lines are recommended for smaller sized kites. If you are doing freestyle and kiteloops, I feel like a short bar helps me to grab and control the kite a little easier. Although, if you always kite in a spot with light wind and big kites, then it makes sense for you to have a bigger bar and longer lines. If you have short arms, I would recommend finding a bar with a stopper so that you can control where the bar stops once you let go of it. This way you can make sure you are able to reach the bar if you let go of it! Board size – When it comes to board size, no matter what your size is, it’s all about personal preference. PERSONAL preference, that means don’t ask a guy for advice! A guy usually prefers a much bigger board, so don’t be afraid to go against other people’s advice and ride a tieny tiny board! If you are quite short, you really don’t need a board that is the same height as you. I am 5’4″ and 48kg and at the moment I am riding a 134cm twintip board with boots. If I had foot straps I would choose a slightly smaller board. A few years ago I was riding a 128cm board but I felt like it was slightly too small for me, especially since I mainly ride in Cape Town and I feel like I need a slightly bigger board to help me ride over the waves! A bigger board will also make for a softer, more supported landing. Whereas a smaller board is generally lighter, easier to handle and will spin faster in rotations. I have a unisex board which is made for freestyle, but if you are new to the sport I would suggest trying to ride a board specifically made for girls. Another helpful tip for a beginner is to make sure your board has a handle in the middle, to help you carry the board easier and retrieve it faster when losing it in the water. And I would advise against using a board leash, they are dangerous and pose the risk of the board hitting you in the head during a crash. And besides, if you’re a girl that’s just lost her board, I can guarantee at least 10 guys attempting to rescue your board for you! Wave size – Even as a professional kitesurfer who has had Cape Town as my home spot for years, I still sometimes get overwhelmed by the size of the waves. And sometimes the other locals don’t even seem phased by them! But I’ve started to realise that for the guys the waves are half their size and for me – they are my size or even bigger! So my advice is: don’t feel bad when you get overwhelmed by the waves, can’t get over them or get tumbled by them easily – the waves are bigger for you than they are for everyone else! Stand up for you size – I can’t tell you how many times I’ve told someone I am a kitesurfer, only for them to ask me if I just started, can I go upwind yet or did my husband teach me? When in reality I am professional, I learnt to go upwind almost 10 years ago and my husband and I started at around the same time. Being a girl, never mind being a petite girl, will cause people to treat you like you’re not capable of great success. As if your size determines your ability. Don’t be surprised when this happens to you but don’t forget to stand up for yourself either! I struggle to speak about my success to others and often downplay it. But I am learning to speak about myself in the right way and you should too – otherwise others won’t take us seriously! Make your size work for you – when that day comes that someone asks you if you have learnt to fly the kite yet, but in reality you are perfecting your first handle-pass, enjoy it! You get to prove them wrong and enjoy seeing the surprise on their face when you tell them the truth! Don’t you just love that moment when you’re doing a trick and everyone stares at you, totally surprised! As if they didn’t know that dynamite came in small packages. And enjoy the small things like only having a tiny kite to pump up and carry around. Enjoy that moment when you crash your kite and 500 guys race to come save you because you’re a tiny damsel in distress (I get really annoyed by this but maybe you’ll enjoy it!) And on light wind days when you are the only one on the water because you are the only one that is light enough to get going, enjoy it! While the other riders sit on the beach and wish they were you, thank God for making you the way you are! Want more tips? – I am happy to answer any questions you have! I love interacting with other riders and giving advice and tips where I can. Leave a comment on this blog or e-mail me: bookings@michellesky.com. And be sure to check out my Instagram and Facebook pages! Thanks for your inspiring words. I am, surprise, a guy reading “kite girls posts” simply since they are closer to my weight than most guys. I am windsurfer and I will likely continue to be but for light winds I was simply annoyed by the massive equipment required, like oversized boards, heavy, huge camber sails etc.. so I decided to get myself some light wind kite gear. Now form windsurfing I find the smaller the boards the more lively and easy it feels on my feet so I would like to pick the smalled size possible to get going. Also bigger boards tend to be uncomfortable in chop – suppose this is the same in kitesurfing. Now I got myself a Naish Ride 10m because it seems to have slightly more power than the average 10m kite heaving only 2 struts. But what board size do I choose? For average winds a 50kg person would perhaps choose something like 128×39 or so, assuming the person is past the beginning stage. But would do tiny people choose for light winds??? Have you tried riding in 10kn winds and what worked for you? Although I have only just started I want to choose the “final” board size – from learning to windsurf I am used to pain and endless practice so no beginners advice or board please. There really is a lack of advice for <70kg people on the net. Perhaps I should start one for windsurfing so more girls can get into windsurfing too. Hi Tom, I am so glad to hear that you enjoyed my post! And you’re right, there really is not enough information for the lighter/smaller riders out there. It sounds like you have a great kite and in terms of a board I would suggest something like between a 130cm – 135cm. If you are mainly riding in lighter winds, then a bigger board will be best since it gives you more flotation and helps you stay upwind easier. I have a lot of experience riding in 10knots and less, on a 9m or 12m kite. I always found that riding a slightly bigger board in light wind helps. Maybe I could write a blog about how girls can get into windsurfing and you could contribute? Let me know!